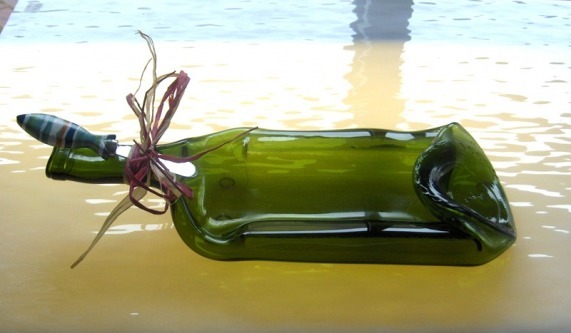 These are my slumped wine bottles that make very interesting cheese trays or spoon rests. I currently have two sizes. Large are from 1.5L bottles and mediums are from 750ml bottles. 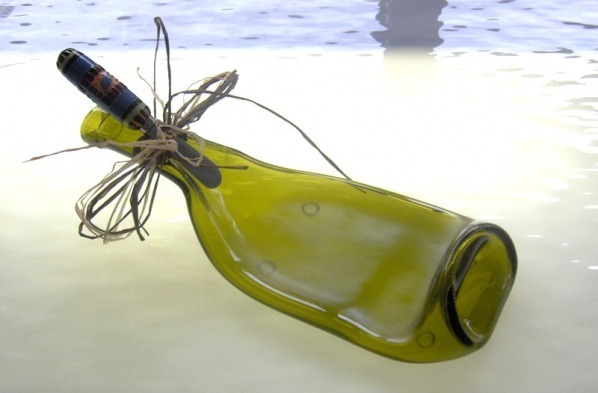 Wine bottle necks are supported during the slumping process to proved a comfortable handle. Each bottle also has nonskid feet. It is not recommended to run these bottles in the dishwasher but rather clean them off with a dish sponge while hold the bottle upside down. This prevents water from getting inside the bottle. Because each bottle slumps differently, some water may become trapped in the bottle and it can be difficult to get it out. All slumped bottles come with a cool cheese knife and raffia!! Can't beat that! Large: $26.95 & includes shipping. Medium: $24.95 & includes shipping. I am happy to slump your own bottle. Please have the lables removed and the inside clean. Allow 3-5 days after I get your bottles for me to slump and mail back to you.